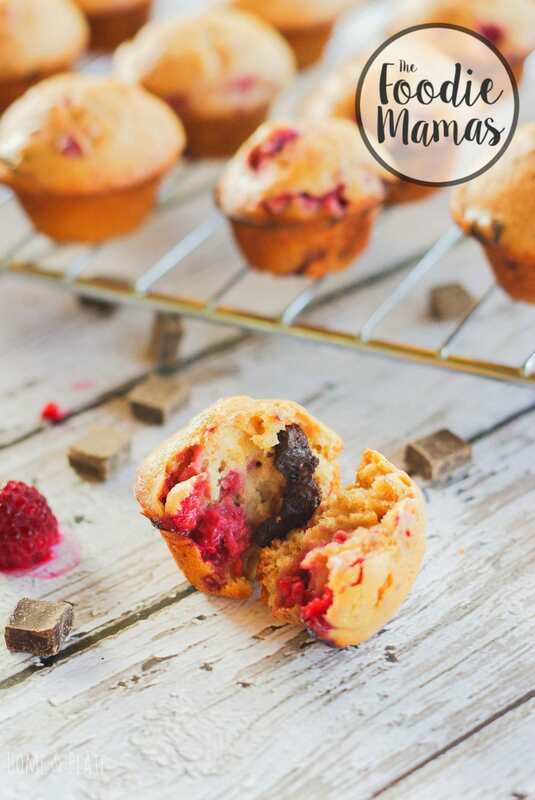 My decadent Raspberry Dark Chocolate Chunk Muffins are filled with dark chocolate chunks and juicy raspberries. There’s no better way to say goodbye to summer than with one of its most delicious berries. As we spring into fall and say adieu to summer, we also say goodbye to our favorite seasonal fruits. I’m a huge fan of juicy plump raspberries. 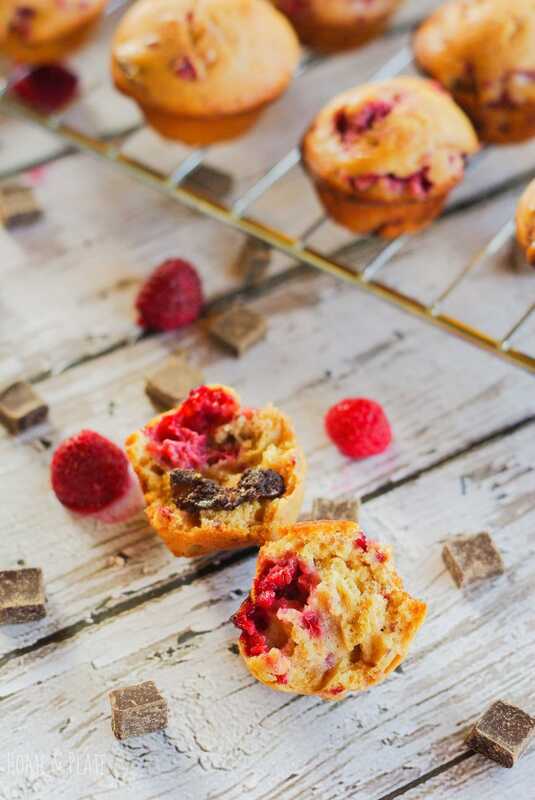 I decided raspberries and dark chocolate would be a perfect combination in a batch of mini muffins. I’ve been creative with chocolate and have come up with some delicious recipes using strawberries, so I was excited to see raspberries on sale in September. This called for raspberry dark chocolate chunk muffins. 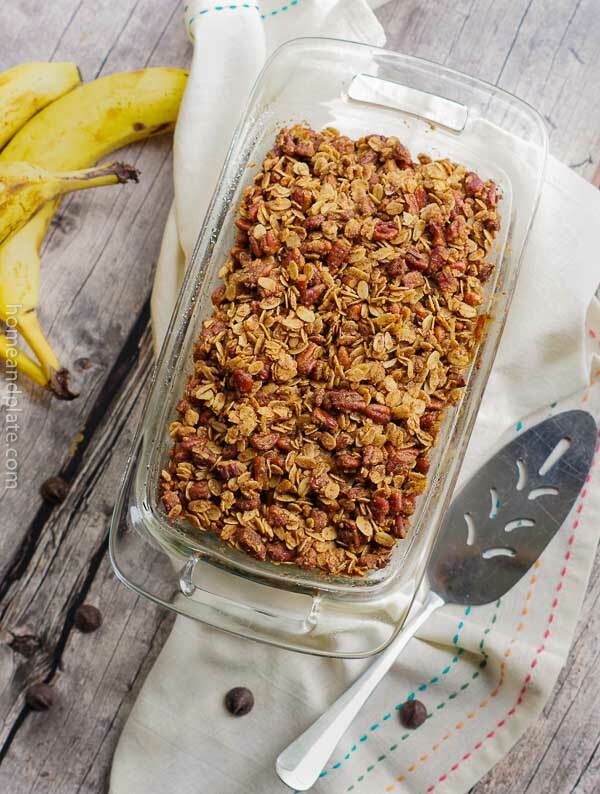 What I love about this simple recipe is that it takes 30 minutes from start to finish and is a simple breakfast snack with your cup of coffee in the morning. It’s also a great afternoon treat when you need a little pick me up. 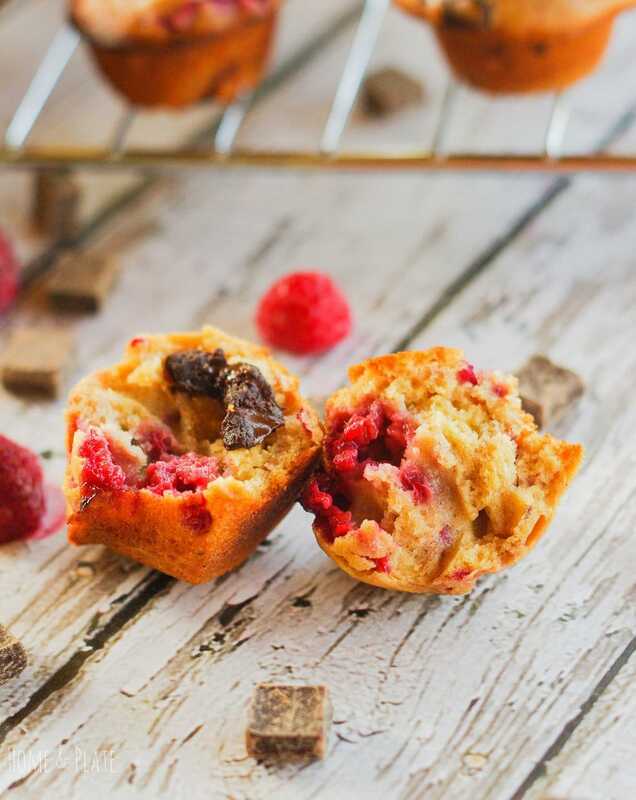 Dark chocolate is supposed to be good for you and raspberries are high in antioxidants so these muffins have to be delicious with little guilt, right? I like to make this recipe in a mini muffin pan because a small bite is the perfect amount. This size serves up well for baby showers, brunches and to-go breakfasts. 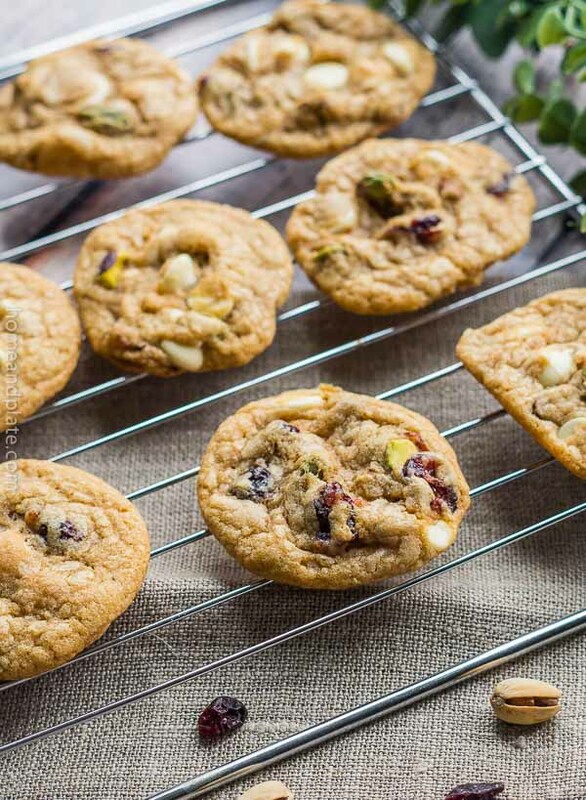 I like to make a big batch and share it with my children’s school teachers during their conference nights and holiday celebrations. They are easy to freeze and pull out when you need them. My Moist Banana Muffins With A Streusel Topping have also been popular and who doesn’t love to share! For this recipe I’ve subbed out half a cup of regular sugar for coconut sugar for a more natural sweetener and I am using a half a cup of vanilla yogurt to cut back on the amount of sour cream in the recipe. I didn’t completely opt out with the sour cream because I wanted to make sure the muffins are moist. It’s the perfect consistency. 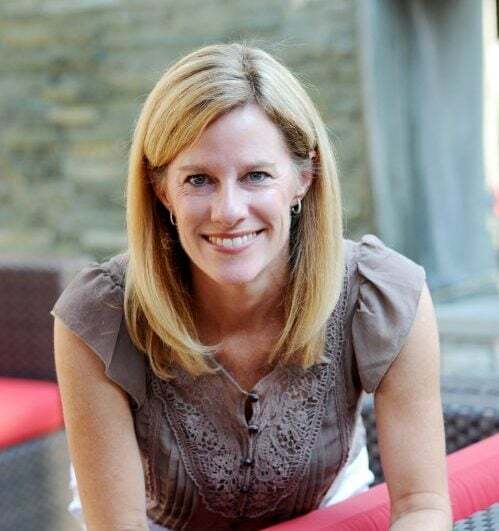 Pair one of my dark chocolate raspberry muffins with my Basic Berry Smoothie or my Nourishing Whole Grain Smoothie with Pears, Blueberries and Bananas. 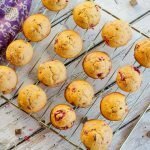 My decadent and moist raspberry dark chocolate chunk muffins are filled with dark chocolate chunks and juicy raspberries. Preheat the oven to 400°F. Beat the eggs using a mixer. Next add the sugars and oil until combined. Add in the flour, yogurt, sour cream, salt and baking soda until mixed well. Finally, fold in the chocolate nibs or chips and raspberries. Spray a 24-tin or 12-tin muffin pan with cooking spray. Fill each to the rim with batter. Bake for 15 to 18 minutes, until lightly golden. Allow the muffins to cool before removing them from the pan. 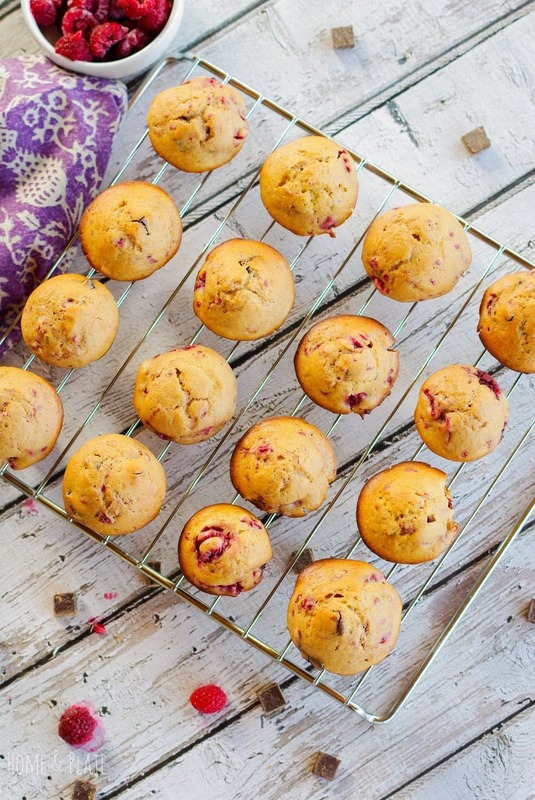 Oh wow, these muffins need to be in my life ASAP! What a wonderful flavor combo! Thanks so much. Chocolate and raspberries really do go well together. Thanks Christine. They freeze well too. These look awesome! You had me at "dark chocolate"! Yummers! Can’t wait to make them. I always say that Raspberry & Dark Chocolate go together like carrots & peas ; ) ! The yogurt is an added bonus to this flavorful combo. Thanks. What delicious looking muffins. I could eat these for breakfast and lunch….and tea breaks too. Thanks Gloria. They really are delicious anytime of the day. OMG raspberries and dark chocolate is the world’s BEST combo! Thanks Sue I totally agree with you. There’s nothing more delicious than that flavor combination.